Lynne Allison Schell, age 71, of Stafford County passed away on Thursday, September 6, 2018 at her home. 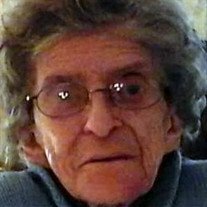 Mrs. Schell was a kind hearted woman who loved her family, animals and bingo. She is survived by her children, Ira Wendell Schell Jr., Melanie Kay Schell and Gregory Paul Schell (Amanda); grandchildren, Aaron Lee Robinson and Emily Nicole Robinson; brother Randolph Grimes (Bonnie); and several nieces and nephews. She was preceded in death by her husband, Ira Wendell Schell; daughter Sherri Lynne Schell; grandchildren Kimberly Rachel Schell and Timothy Ira Schell and her parents, Tillman and Edna Grimes. The family will receive friends from 6 to 8 p.m. on Monday, September 10th at Covenant Funeral Service in Stafford, VA.
A funeral service will be held on Wednesday, September 12th at 12 noon in Petersburg, West Virginia at the Schaeffer Funeral Home with the Rev. Joseph Gerstell officiating. The family will receive friends one hour prior to the funeral service. Burial will be in the Maysville Cemetery, Maysville, WV.